Cattle producers for stacked generations in our pedigrees have allowed us to respect this industry. Both studying Agricultural Communications in university, we gained skills in photography, video and print marketing now used to create branded campaigns for our customers. It is with this coupled trust in livestock knowledge and creative talent that we serve livestock producers from across the United States and Canadian provinces. Specialized in livestock marketing, we take the approach of carefully branding your operation with integrity at the forefront of our business. Our team handles all your livestock marketing needs to create a consistent brand through a seamless workflow! People often say we live in a digital age, but to hold a tangible marketing piece in your hand has and will continue to be very important. When you look in your mailbox, display items a trade show or personally hand a business card to someone, standing out is vital. Let us create that piece for you that will attract more customers and tell the story of your operation. 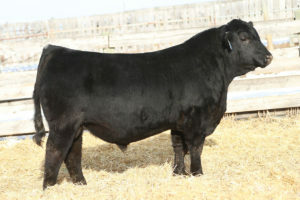 Sale pictures and videos can be one of the most important pieces of livestock marketing. We’ve heard it over and over again, but, a picture is worth 1,000 words. And to get 1,000 potential customers to view your cattle is going to be an investment well spent. 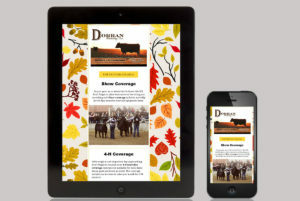 Don’t forget to picture your donors and sires, as their pictures are influential in your marketing for years to come. Your landing page on the Internet is very important, and that’s just what a website does. 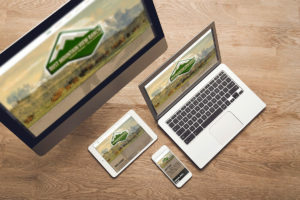 Having online presence with a website will provide answers for prospective customers, creating more interest in your livestock. Websites can be as large or concise as you would like them to be. We want to create an easy to navigate, attractive look for you in a mobilization format, the most often viewed type of website. When you think of coke, what color and logo do you envision? We want to provide that Coca-Cola branding for your livestock operation, that visual image people get when they hear your name. Let us provide the fundamental pieces to creating your brand – logo, business cards, letterheads, social media profile picture, and the list goes on and on. That consistent look throughout your marketing will engage your customers in the recognition of your products. Want to tell the story of your operation? Let us capture promotional imagery of your family operation working together. 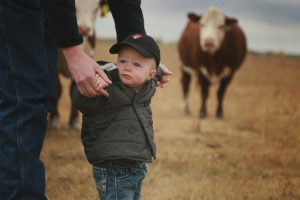 The production sale, field day and scenic farm pictures are a great way for prospective customers to see your farm or ranch, sparking interest in your cattle operation. These images can serve as marketing pieces for years to come whether in print advertising or your online presence on the web and social media. Reach a large audience with an email list we have gathered for more than 10 years of working with customers across a broad region. 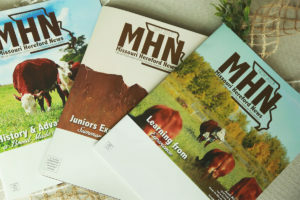 This is a great way to market your cattle by sending reminders of upcoming sales and events. Divisions of Dorran Marketing, Inc.